Any oversized shirt and skinnies is pretty much my weekend ‘mom’iform. I love this one from Topshop because it’s a small check print, and different from a lot of my other plaid style shirts. I recently got this for my birthday and have been wearing it a ton. It’s just so perfect to and easy to wear while playing with the girls on the floor, chasing Aria around the house (outside if this rain would ever quit these days) and it’s also very functional as a nursing mom. I know you’re probably thinking mom uniform in those shoes? YES. YES. YES! These are amazingly comfortable (I mean I’m probably not going to wear them to the park, although I have and they’re great), but running errands with both girls is actually a breeze because they are SOOOO comfortable! Thanks for stopping by. I hope you have a great Weekend!! 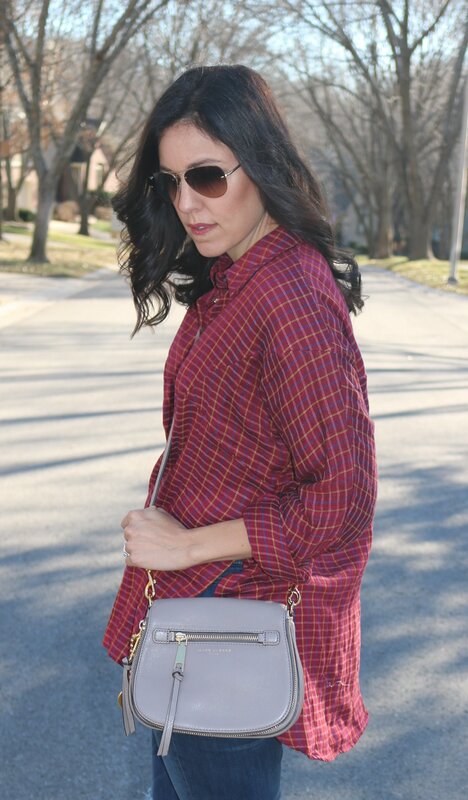 Linking up with: Walking in Memphis in High Heels + The Fashion Canvas, Beauty By Miss L, Style Elixir, Elegantly Dressed and Stylish, I Do DeClaire, Garay Treasures, Style Nudge, Myriad Musings, Shopping My Closet, Posh Classy Mom, Get Your Pretty On, Rosy Outlook + Seeking Sunshine, Pumps and Push Ups, Living In Color Style + Stylin In St. Louis, Curly Crafty Mom + Doused in Pink and The Pleated Poppy.